Every time I think about health care in America, I am more and furious at how diastrously wrong we have allowed it to go. There's just no excuse for this. 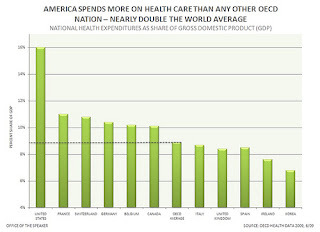 Most importantly, I want everyone to understand that Americans ARE NOT HEALTHIER. If you pay twice what someone else pays for a product, you'd expect it to be better, right? It's just crazy. And every single Republican in the US Senate has decided that this is a problem they do not want to solve. As much as the Ben Nelson's and Joe Liebermans of the world make me nuts, in the end they demonstrated some minimal sense of comapssion for the American people with their yes votes. Republicans should hang their heads every day in shame for what they are allowing to happen. Yes, am angry. That about sums it up, I reckon. Since he made it clear he WOULDN'T vote for it without a bribe, the question Americans should be asking is: "How much I willing to personally suffer in order to punish Ben Nelson?" Or in other words, "Is it OK if I'm screwed as long as I know Nebraskans are no better off?" I think it would be neat if we could reduce the deficit just by wanting to really badly. That would be so much more fun than having to raise taxes or cut spending. I'd also like to lose weight by eating more. I'm sure it's Obama's fault that I can't do this. So I had a chat today with my Dad. Dad's 1) a smart guy 2) reasonably informed and 3) favours health care reform. So I was surprised to hear him say that he was glad that the current health care reform proposals haven't gone through. His perception was that there had been too much back room dealing, to many negotiations, to many compromises. Now bear in mind, Dad's a natural New England Republican in many ways - so it wasn't that he wanted something more radical, he's uncomfortable with government expenditure generally but recognises that health care is a problem that needs to be fixed. In many ways he's the EXACT constituency this bill was designed to appeal to. So what's the problem? Essentially, he's been turned off by the process. No one has sold this bill to him, and a lot of folks have been talking it down. He's been hearing about the compromises with Ben Nelson, and months of wrangling and has come to the conclusion the whole thing hasn't been well considered or thought through. So here's my message to my Dad and the millions and millions of Americans just like him: I hear you. The process sucked. It did. But you are presented now with a simple choice. We pass this bill, which will cover more than 30 million Americans more are currently covered, will REDUCE the deficit, strongly regulate the insurance companies, and provide security to every man woman and child that they will always be able to get health insurance. Or we do not pass it, and bankrupt Medicare within a generation, continue to pay more than twice as much for health care than any other nation on earth (without being any healthier), and still leave abotu 46 Million Americans without health insurance. This is the bill we can pass, and it will make life in America better. Or, we can let it die and be worse off. Everything else is... window dressing.